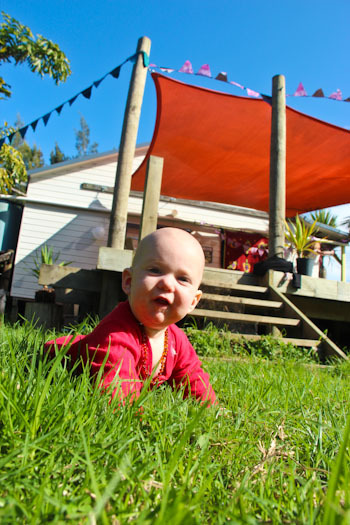 Today there’s a cheerful crew preparing for the party of the decade — the Bush Fairy Dairy’s 10-year anniversary! Never one to sit idly by, I kept popping over to the dairy to see what was going on. But first, I had to finish my bunting. 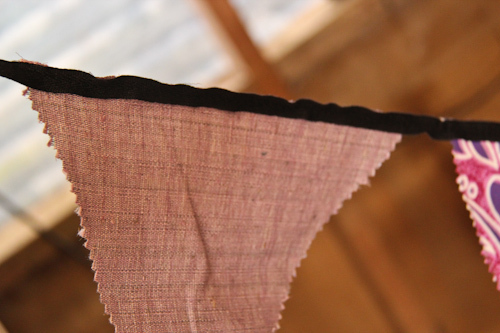 I used some fabric I had salvaged from the caravan of a community member who has moved on. I know Kiri would be happy to see her fabric put to use like this. 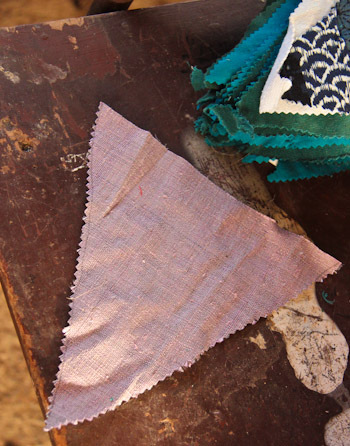 I cut triangles from scrap fabric, using pinking shears on two sides to prevent the cloth from fraying. 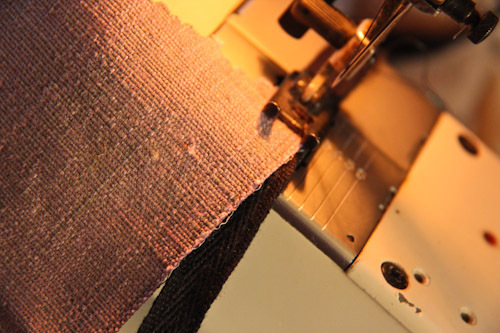 Using a straight stitch, I sew the straight edge of each triangle onto a long length of cotton ribbon. The finished product is colourful and robust enough for a party or two. When the bunting was finished, I took it over and presented it to Beryl yesterday. 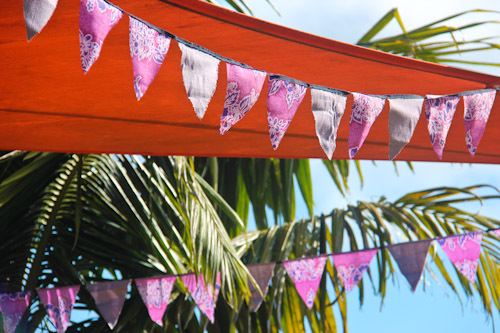 Initially I wanted to string it up at night as a surprise, but David encouraged me to give the gift in advance, saying that the anticipation of using the bunting would increase Beryl’s pleasure on receiving it. I think he was right. 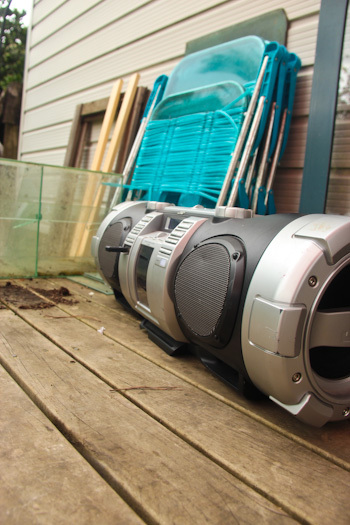 We take our stereo over to the dairy to start the party going with some dancing music — African style! 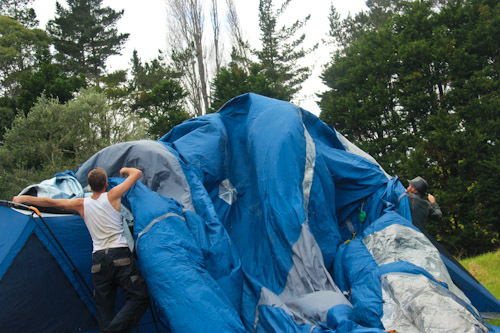 Nathan and David throw the cover over the top of a huge family tent that will provide undercover playing space for the children. 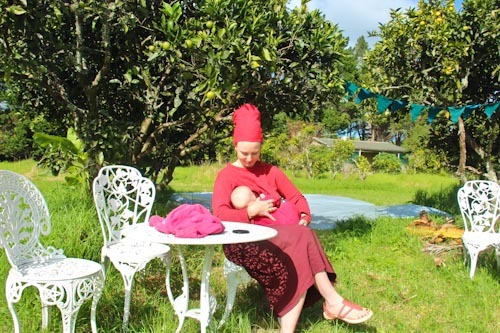 When Elijah wants a feed, I come to the dairy to sit in the sun and watch the action. My bunting is already strung up and fluttering in the wind. 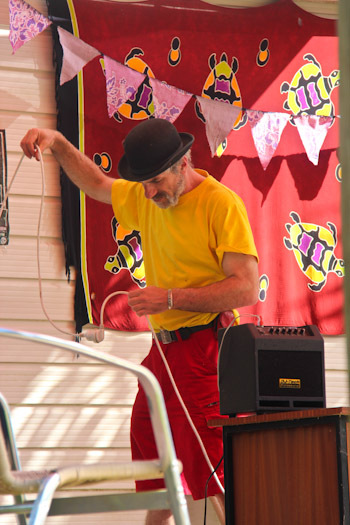 Pedro sets up the sound system for both live and recorded music. 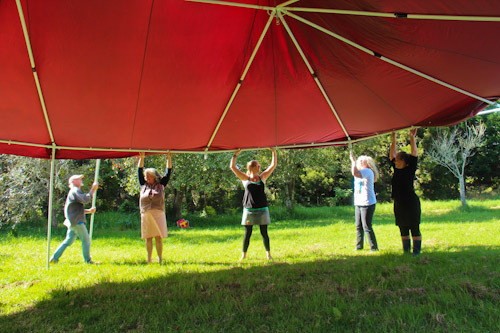 A team effort is needed to get the big marquee onto its legs. Elijah watches the action and enjoys the feel of the grass. 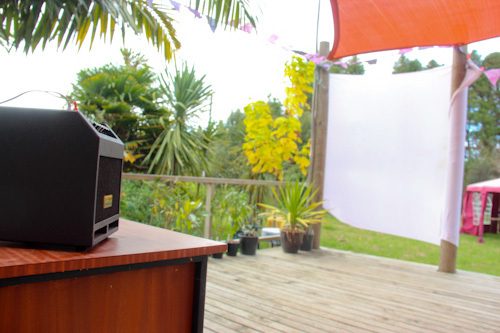 A white sheet is pinned against two pillars to provide a screen for the video projector. Ever since hearing about the party — and especially the fact that it was a costume party! — our girls have been planning what they would like to wear. 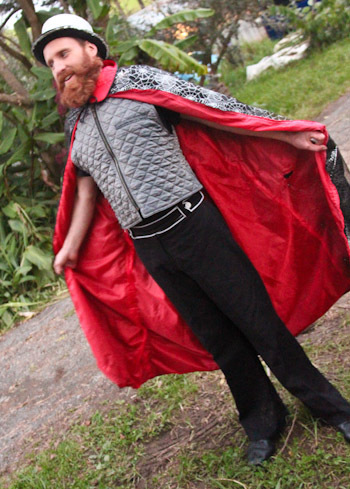 While we visited the town of Kerikeri last month, we looked in a secondhand shop for some costume pieces. Actually, the shop was closed, but David started talking to one of the woman who was working there, and she invited our family to enter the shop (on a Sunday) for a private viewing/shopping experience. It was quite a privilege, and we were glad to find some good items for our outfits. 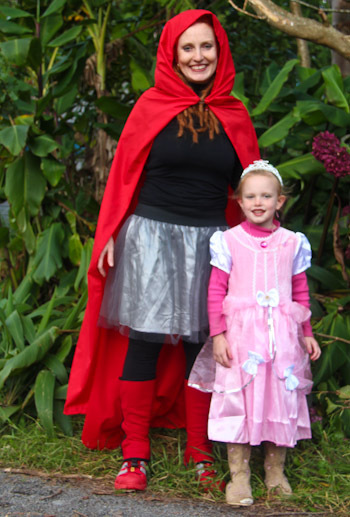 I sewed a hooded cape and became Little Red Riding Hood. Brioni is a princess. 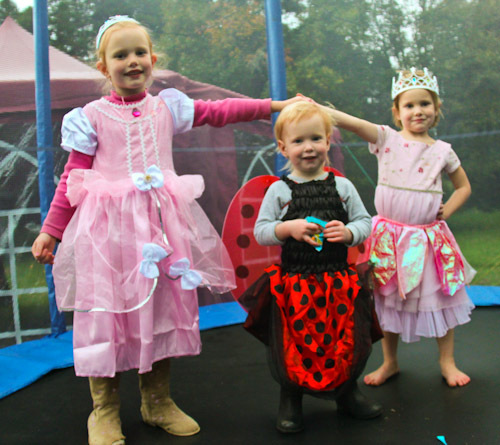 Dressing little girls for costume parties is quite easy (and lots of fun)! Dell was happy to wear her ladybug wings for just a short time. 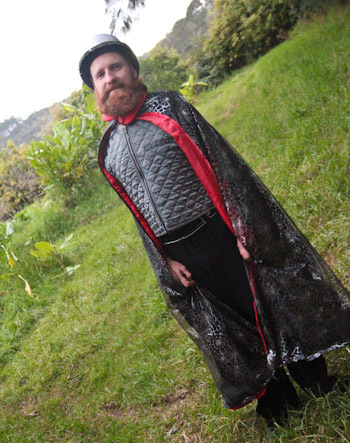 David added some sparkly fabric to the outside of his cape to create a dashing look. David's showing off his fabulous, silvery style. In the end, Aisha didn’t ever dress up in her costume. But we overdressed, making up for it, I’m sure!